Industrial Plankton attended the 2018 Aquaculture America conference in Las Vegas, Nevada. 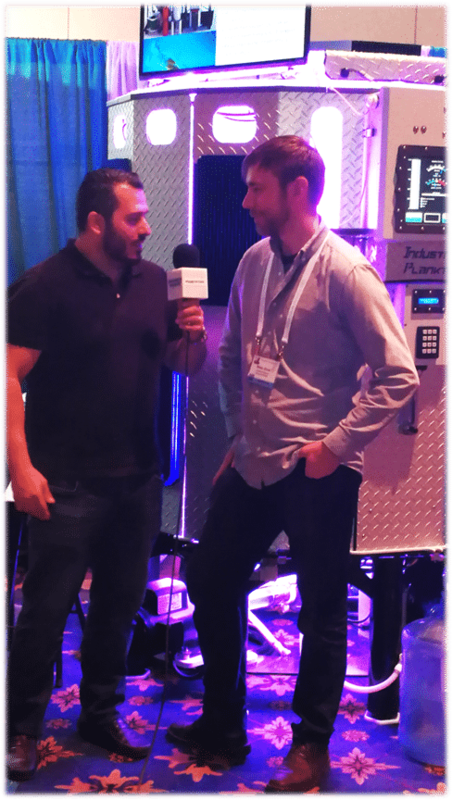 Shawn Glover being interviewed by Christian Criollos of Panorama Aquaculture & Aquaculture Magazine in front of Industrial Plankton’s new 1250L PBR. About the show: AQUACULTURE AMERICA 2018 returns to one of the favorite entertainment spots in the world for the only major national aquaculture conference and exposition held in the U.S. The U.S. Aquaculture Society (formerly U.S. Chapter of WAS) joins with National Aquaculture Association and the Aquaculture Suppliers Association to produce the annual Aquaculture America meetings. These sponsors are joined by the annual meetings of Aquacultural Engineering Society, Americas Tilapia Alliance, Striped Bass Growers Association, US Trout Farmers Association, and many more associations to make Aquaculture America 2018 the one meeting in the U.S. that you don’t want to miss! We are looking forward to next year’s Aquaculture America event in New Orleans, Louisiana.